A group blog devoted to the baptismal call, spirituality, gifts, vocations, ministry, work, history, theology, evangelization, formation, bad jokes, and pastoral support of lay Christians seeking to live their faith in the 21st century. Sponsored by the Catherine of Siena Institute www.siena.org. Simply extraordinary. A riveting story that gives some sense of what God can do when one person answers and is doggedly faithful to a challenging call over a lifetime, even in one of the most difficult places on earth. 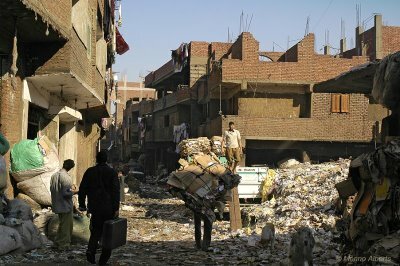 very encouraging to read this article from the February Lausanne World Pulse: Transforming Lives in Cairo's Garbage Villages. Villagers collect garbage from city apartments and recycle it. They are the most despised group of people in Egyptian society. They are not paid by the government; however, they receive small tips from the people whose garbage they collect. The rest of their income comes from recycling garbage. It is one of the most ecologically efficient operations in the world as 90%of the garbage is recycled. But the human cost is terrible. Muqattam, now a thriving town of 30,000 began in 1970, when a community of several thousand Coptic garbage workers were forcibly resettled in an abandoned quarry at the foot of a small mountain. Thirty years ago, Fr. Samaan, a Coptic Orthodox priest "gave up his job in the city to become an ordained priest in the garbage village. When he began, the village had no churches, schools, electricity, water, medical care or markets. It was just garbage, people and pigs. When thousands were brought to a saving faith in Jesus Christ, the first thing they wanted to do was build a church—and Father Samaan became their priest. Today, the garbage collectors are filled with love and motivation from God. This is what changed their village. The village is a bustling, hopeful community of thirty thousand people. They still collect garbage; however, they now have three schools, a hospital and many churches. Father Samaan now pastors the largest church in the Middle East and one of the best known in Egypt: St. Simon the Tanner Coptic Orthodox Church in the Mokattam garbage village. The cave churches have become something of a tourist attraction as you can understand when you see this series of pictures of this extraordinary place and its extraordinary community. Back in the 1970s, wasn't there a nun who worked with these people? I think 60 Minutes did a feature on her. Praise God! I know one Coptic orthodox priest who has personally baptized over 500 Muslim converts himself. 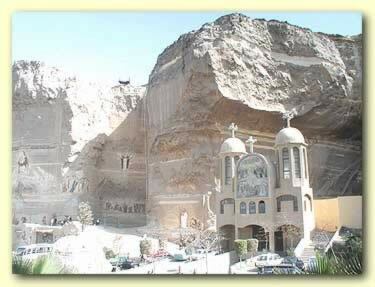 The Coptic Orthodox church is the largest church in the Middle East/North Africa. Sherry, thanks for high lightimg this on Intentional Disciples. I got to hear Rebecca Atallah speak at Urbana '96. Her talk is still available on the Urbana web site via Real Player, although you may need on older version to play it. Alas! InterVarsity no longer offers cassettes or CDs of the Urbana '96 talks, and my tapes are wearing out! 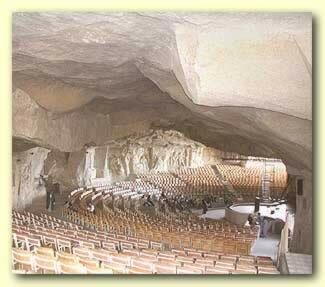 My wife and I were just in Cairo last week and visited the Cave Church and surrounding areas. Heard an amazing testimony by a former alcoholic who now works at the church. God is doing such things in many places around the world. Number 1 there is no god. You are wasting your lives chasing nothing. Try to help others and stop trying to insure YOU get paid off in the end with a trip to the great fun house you call heaven. If there was a god he just threw tons of huge boulders on these people and killed hundreds. He is also preventing any rescue crews from coming. Do you get it? No god. If you had actually helped these people rise out of the horrid situation of living in a dump, maybe you could have saved a few. You seemed to have taken the fact that they live in extreme danger below a cliff as being good for YOU. Do you really think that's what a god would want? Instead of helping, you had to treat them like a tourist attraction or a zoo. You decided the best action you could take is to use these poorly educated, outcast, Mothers and Fathers, Daughters and Sons, to make yourself feel better about your irrational thoughts. Maybe if this "holy" priest had helped them build schools, roads (so emergency vehicles could reach them) and a sanitary living environment, instead of forcing them to build churches, more of them would have been able to leave this horrid existence. Evil does live in your heart. Praying for the weak, is preying on the weak. Try actually helping. You bring up some valid points. Many Christian missions trips end up just being trips for wealthy suburban Americans to go and feel inspired by people persevering through their awful circumstances. Then they go back to their big homes and safe comfortable beds. I think that you are mistakenly assuming that this is an example of such a story. From what I have read, it seems like much more than that. You ignored the fact that it was the people who wanted the church. People don't just need clean water and functional roads. While they do need these things, what they need more is hope. Jesus brings that. All of these people living in a world that is obviously fucked up have finally been told that God actually cares. He came down as a human and died in place of the death that every fallen, broken, and polluted human deserves. All of our imperfections died and then he came back to life, perfect once again. Death died. That's a message of hope. When that message was told to these people, when they heard that God cared, that God takes the dead and broken things of the world and makes them alive again, that his final plan for all creation is restoration they no longer had to be hopeless. As a natural outflow of that same message Christians have gone over there and helped those people, practicing that same resurrection we see in what we call the gospel story. They have cared for the sick and abandoned and helped them live a life that respects their humanity. What little good has been done for these people has been done by those moved to action by the hope of a better world through Jesus' actions, words, death, and resurrection. I have applied to go on a trek there this summer to help them and to let them know they are my equals. Keep in mind that my desire (and the desire of many others to do the same) is fueled by my understanding of human worth being grounded in the Biblical idea that humans are created in the image of God and have value to him and as a member of his body I am called to do as he has done. It is the result of prayer that is not preying on the weak, but a call to action to help the weak. If I haven't addressed any of the issues that you have with this article or the Christian work done there, just post again and I'll try to address the issues. I checked the little checky box to email me the follow-up comments after this one. May the grace, peace and love of Jesus be with you.